While producing our new video Building an O Gauge Layout, we decided that there was so much we wanted to talk about we couldn't fit it all into one video. So we decided to use this website to include the extra segments we ran out of time for, plus continue to add new articles on layout building techniques. When you have a 90-minute window to discuss how to build a model railroad, you can really only scratch the surface. So this website will serve to help us broaden the scope of that production, and answer questions you may have after watching the DVD. In addition to the new articles written specifically for building an O gauge layout, we invite you to also look through the older articles on this site including the layout tips previously posted before the video was produced. A few years ago, we recommended several products for Lionel to consider producing. A few of them were, including a re-issue of the Postwar HO Banjo signal. This accessory is too big to be HO scale, but it's perfect for O scale. The new version is called the Scale-sized Banjo Signal. 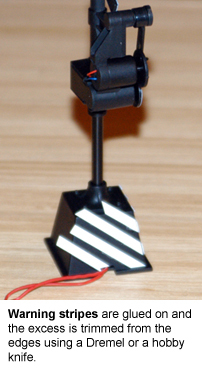 Instead of the Vibrotor drive mechanism that the original version had, this new signal uses a DC motor which necessitates the inclusion of an electronic component to rectify the AC current from the toy train transformers to DC. To accommodate the new rectifier board, the base was raised considerably. This tall black base looks a bit plain. Months ago I was browsing the message board at O Gauge Railroading, and someone suggested applying thin strips of tape diagonally across the base to simulate warning stripes. Postwar collectors will recall that the 155 Ringing Signal has safety stripes on the base. Many years ago it was common to see the concrete bases of railroad crossing signals (and traffic lights) painted with safety stripes. I loved the idea. Instead of tape I decided to glue strips of white plastic. You can use whatever you're comfortable with. The tape is good because if you make a mistake it's easier to correct. But I used the plastic because I wanted something sturdy and permanent. If you want to try using tape, most hobby stores will carry thin tape for various applications such as road striping and creating masks for paint. If you go the permanent route you will need #106 Plastruct strips of white plastic, a hobby knife, and model glue. I cut short sections of plastic that were about 1.5 inches long. On one end, I'd "miter" the edge with the hobby knife so the bottom edge had an angled cut. Then, I glued a plastic section so the bottom angled edge was against the lip of the base. The strip would lay across the base at about a 45-degree angle, slanting down from left to right. You can see in pictures that the edge of the "mitered" edges should change depending on where each section of plastic would come to the edge of the base. For instance, on the bottom edge of the base the mitered edge is in one direction, but along the sides the mitered edge is reversed. Applying model glue to the thin plastic is a careful process. You don't want to use too much because you'll have a big nasty mess on your signal that will be tough to recover from. With some of those metal tubes you'll find that there may be a bit of a clog of dried glue, and if you just squeeze the tube until the clog is cleared, you'll have massive amounts of glue to clean up. Just clear the nozzle with a straight pin. Lightly dab the surface of the plastic strips with tiny beads of glue. You can use the straight pin or a toothpick to do this. Then carefully lay the piece upon the signal base. I started with the longest section, which was placed at the bottom right corner and lead up to the upper left corner on the front panel. There will be excess plastic overhanging from the upper edges. Once all the pieces are glued onto the first panel, let dry. 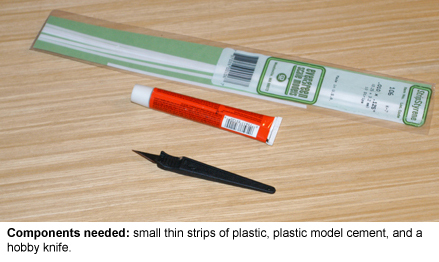 Refer to the glue packaging to determine how long you need to wait for the glue to dry. After the glue has dried, you can trim the excess plastic. The plastic is thin enough that you should be able to use the hobby knife to either score or directly cut the plastic. Be patient and work carefully and slowly. Another option is to use a Dremel. Use a sanding disc instead of a cutting wheel. As I've said in the video, using a Dremel takes a careful steady hand. Don't attempt to use it for this project unless you're really comfortable with it. After one panel is completed, you have two options to consider for the remaining three. One is to simply cut and place the strips exactly as you have done for the first panel. The other option is to "continue" the stripes from one panel to the next. In other words, when one stripe ends on a panel along the side, you glue the next stripe from that point on the following panel. If you've opted for the tape stripes, this continuation will come naturally as you turn a corner on the base. But with the plastic strips, you can only apply them on one panel at a time. The stripe continuation option is tricky because ideally when you're on the last panel, you are trying to match the direction of the stripes as well as having the edges of them meet two panels as perfectly as possible. What you can do is start on the panel of the right side, that way the back panel might have minor mismatches and it will be obscured from view. Once you're done, you'll agree there's no doubt about it. The safety stripes add a lot to the appearance of the signal.